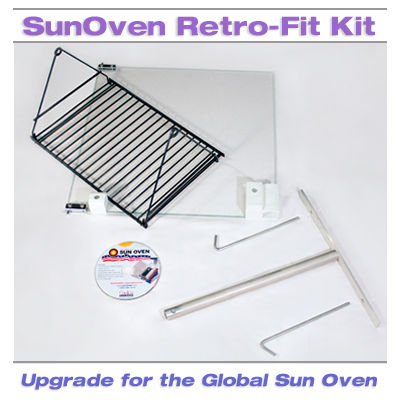 Global Sun Oven Retro-Fit Upgrade Kit. Free Shipping within Contiguous U.S. This kit will upgrade a GLOBAL SUN OVEN® to include many of the innovative features of the All American SUN OVEN®. Sun Oven not included. Make it easy to stay in accurate alignment with the sun for maximum temperature. The E-Z Sun-track indicators have two holes. As the light of the sun shines through the top hole, a small round dot of light will appear inside the indicator. When the oven is perfectly aligned with the sun, the round dot will be centered over the bottom hole. 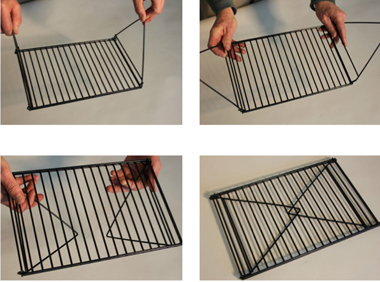 The dual-purpose leveling rack hangs inside the oven and swings freely to prevent spilling of food when refocusing the oven. The dual-purpose leveling rack side arms can fold below the rack to sit on oven floor to increase the usable area inside the SUN OVEN® and accommodate larger pots, pans, or baking bags. Adjusts to maintain maximum exposure to the sun. Allows you to raise or lower the oven's orientation to meet the sun on the horizon with increased stability. To prevent blowing over in high winds, the alignment leg can be staked to the ground or tied to a table.